Indian Navy invites application from unmarried male candidates for Naval Armament Inspection Entry Scheme (Permanent Commission) Course Commencing – JUN 2017. Apply Online before 09 December 2016. Educational Qualification : Candidates should have passed BE/ B.Tech degree or in the final year of Engineering Course in any one stream i.e. Mechanical, Electrical, Electronics, Production, Instrumentation, IT, Chemical Metallurgy and Aerospace Engineering with minimum 60% aggregate marks till V semester. Age Limit : 19 ½ to 25 years, born between 02 Jul 1992 and 01 Jan 1998 both dates inclusive. Selection Process : Selection will be based on Service Selection Board (SSB) interviews based on their performance in educational qualification. 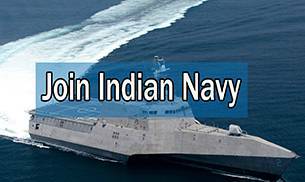 How to Apply Indian Navy Vacancy : Interested Candidates may apply Online through the website www.joinindiannavy.gov.in form 19.11.2016 to 09.12.2016. candidates may also send Hard copy of Online application along with Self attested photograph, Self attested photo copies of 10th & 12th class certificates along with Mark Sheets, other educational certificates and mark sheets of all semester/years to Post Box No. 02, Sarojini Nagar PO, New Delhi – 110 023 on or before 19.12.2016.